Burn my soul, dear God above, that all dross this day may banished be. I offer here myself a sacrifice, blinded by the blemish that I have become. The sin which so easily entangles has done well its work in me, until from the depths I cry unto Thee, knowing full well that Thine is the only hand that can make me clean. Yet lingers a fear, a shame that downcasts my soul – have I the faith to touch Thy hem as a woman years ago had done? This is the fire of which I speak: a cleansing flame by Spirit driven that returns me to the dust from which I came. But in my dying I am raised, for spotless Christ proclaims, “She is in Me and I in her – My blood has made us one”. The fragrance now raised before the Throne is that of mingled flesh, as all sin, shame and spot are burned. My Husband has once again presented a spotless Bride to Thee. Oh would that it did end there! But you, my whoring soul, are so like Israel, that day after after day this same must be done. How great is my desire to be true, faithful, and pure and yet how great my shame as once again you find me selling my soul to another. How well Thou knowest Hosea’s grief! I beg, therefore, that through judgement and patience Thou would teach me to be a Wife. I seek to be not a daughter of Eve but a daughter of Mary. Through the power of Christ, may the incense of this handmaiden’s faithful prayers be greater than the fragrance of my sacrificed sins. 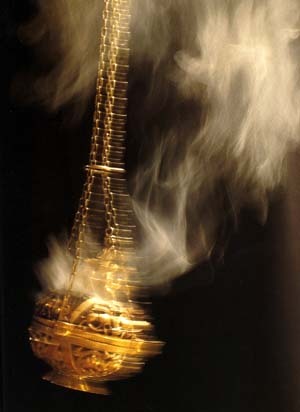 And in this may I be a pleasing aroma, the Fragrance of Christ to Thee.